We spoke to 74 women working in tech to find out what needs to change. Based on our research, here are some simple steps you can take today to boost the number of women in your tech team. 74% of young girls express an interest in STEM fields and computer science, but only 18% of undergraduate computer science degrees and 26% of tech jobs are held by women. Historically, the tech sector has been white, young and male. Over the last two decades, the industry has worked hard to convince women to start – and stick out – careers in software engineering. Did you know there are only three female tech CEOs in the Fortune 500? 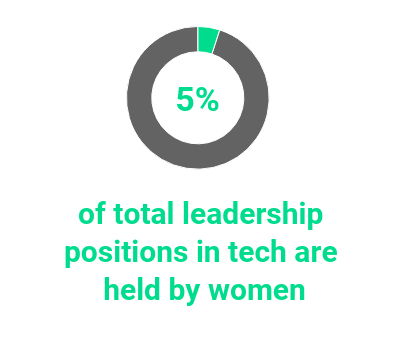 What about the fact that less than 5% of total tech leadership positions are held by women? The sector clearly still has a long way to go. Tech’s “women problem” is well-documented. But what are the solutions? The good news is that there are some simple steps HR departments can take to hire more women. Based on in-depth research and our experience in the industry, we’ve put together a guide to help HR teams, recruiters and talent acquisition specialists in the tech industry balance their tech teams. We spoke to 74 women working in tech, as well as women working in startups’ HR teams, to get the inside scoop on what it’s like to work in the industry and what they think needs to change. In this guide, you’ll find everything you need to find and hire more women in tech. 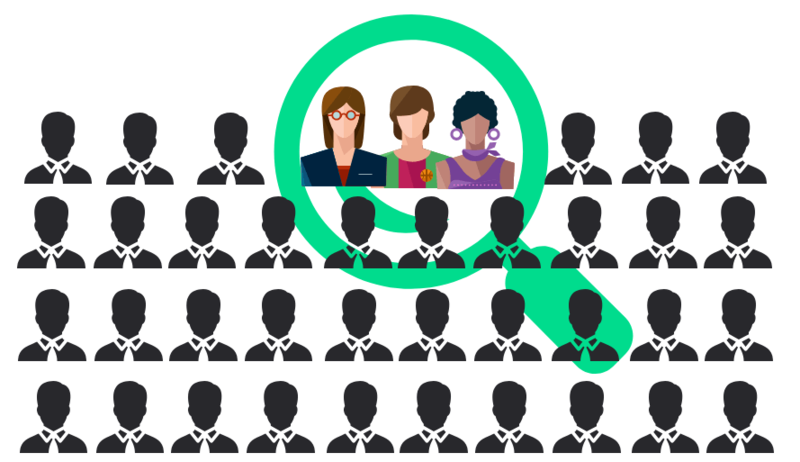 From supporting the next generation to changing startup culture and improving candidate experience, we’ve documented the changes you can implement to increase the number of women in your company – and retain them for longer. Hiring more women is a huge goal, and it can be hard to know where to begin. As recruiters and HR managers, perhaps the best place to start is with the recruitment process itself. In theory it’s the area where HR teams exercise most control, so should be the easiest to change. Which is lucky, because women in tech believe startups still have some work to do. Only 19.3% of the women we spoke to thought recruitment processes actively put female candidates off – which is great news! But 95.4% of IT professionals felt that recruiters and HR teams need to do more to engage women and improve their candidate experience. Take a look at what else the women we interviewed had to say about candidate experience. 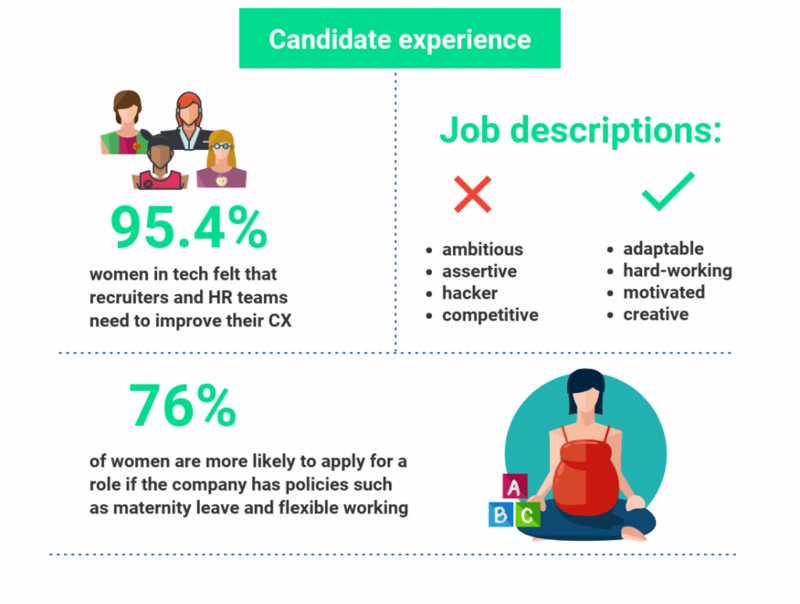 So, how can you improve the candidate experience for women in tech? We’ve pulled together four steps recruiters and HR managers can take – right now – to improve candidate experience and make sure more women who apply for tech roles stick out the recruitment process. Women don’t want to be the “first Senior Technical Engineer”. They’re much more likely to apply for a job if there are women in the company’s senior leadership team. They’re also more likely to accept an offer if they meet female employees during the recruitment process. If you have female team leads or senior engineers, balancing the gender of interviewers should be an easy change to implement. And if you don’t, perhaps it’s worth looking at the percentage of women in your company and making some deeper cultural changes. 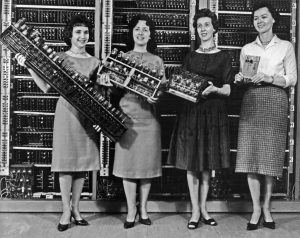 The ENIAC builders recruited six women who became the world’s first coders, manipulating the ENIAC to calculate missile trajectories. Image by wiki commons. Although the situation is improving, women working in tech still sometimes experience pay inequality, preconceived expectations or even sexual harassment. Several of the women we spoke to had faced discrimination either at work or whilst studying computer science at university. Find out what else women in tech think startups need to change. Even if a startup has a gender-neutral company culture, it’s understandably harder to convince a female applicant to join if they’re one of the first women in the tech team, you don’t offer a wide range of family-friendly benefits or you have discrepancies in pay between men and women. There are certain aspects of jobs that the tech industry could focus on if they’d like to appeal to more women. For instance, a woman with children is probably going to value flexibility and the option to work from home. 76% of the developers we spoke to believe startups need to do more to prioritise and actively promote family-friendly policies. Clearly setting out the company’s family-friendly policies and including them on the careers website, in job descriptions and discussing them openly in interviews are actions you can take immediately. And if you don’t offer flexible hours, the opportunity to work part-time or remotely, or fair maternity and paternity policies, make them a priority in 2018. 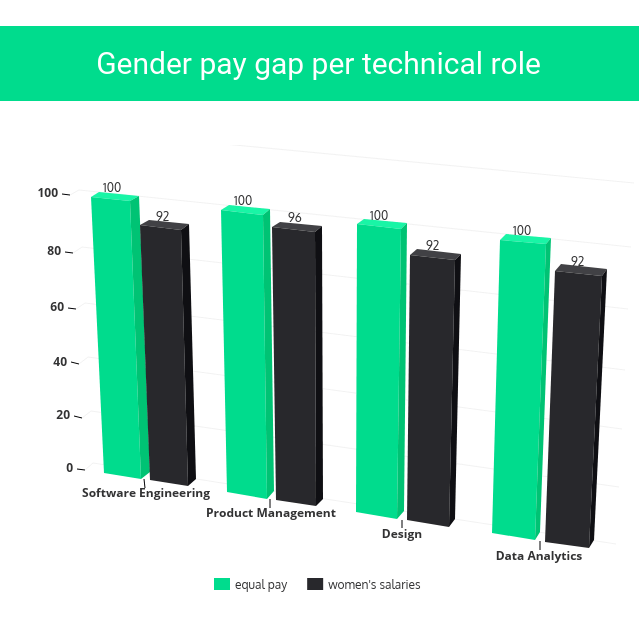 As is the case in a majority of industries, the tech world has a giant gender pay gap. If your startup already makes a concerted effort to ensure equal pay, then mention it in your diversity statement, publish an annual report to detail your progress and discuss the issue in interviews. Even if you’re not ready to openly publish salaries, taking these steps will demonstrate to potential female candidates that you care about the issue and are doing something about it. Startups need to work on their company culture and the experience they give female candidates. But simply addressing the tech gender imbalance when a female developer applies for a job or submits their CV at a careers fair is not enough. Women in tech believe startups also need to nurture the next generation of female developers. It was clear from our research that women lack female role models, educational opportunities and visibility. They lacked a sense of “belonging” to a tech community, but they also lacked the facts – the doors that open as a result of a computer science degree or the amount of money developers have the potential to earn, for example. Many respondents felt that the opportunity to meet women who work in the tech industry would have been invaluable when they were making their career choices. These are all things that startups have the power to change. 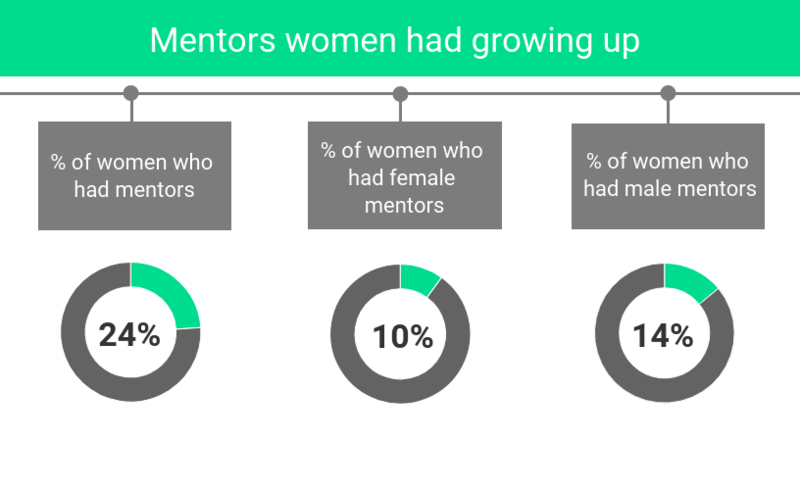 Our research showed that female developers value mentors, yet there is a lack of women available to provide leadership. Startups have an opportunity to step up and fill the gap. Setting up and promoting mentorship programmes – and encouraging female staff to participate – will not only help nurture the next generation of developers, but will also make your startup more attractive to female candidates in the short term. An event could be something as simple as a tech meetup, panel of speakers or evening networking drinks. If you don’t have the resources available to set up an event from scratch, think about sponsoring an existing tech conference or university event and encouraging female employees to speak. Need to convince the Senior Leadership Team? Setting up an event to connect, encourage and inform the next generation of female developers is also an incredible networking and marketing opportunity. And don’t forget about your current employees! Organise regular internal events so female employees can network, invite a speaker and continue building the female tech community. For women from minority groups or without the resources to enrol in higher education, it’s even harder to access the opportunities that lead to a career in tech. There are lots of incredible programmes that encourage underrepresented groups to code. And you can support them with anything from a one-off donation to becoming an ambassador. Check out Girls Who Code and She Plus Plus. Supporting underrepresented groups is also a great way to engage existing female staff in volunteering programmes or fundraising events. 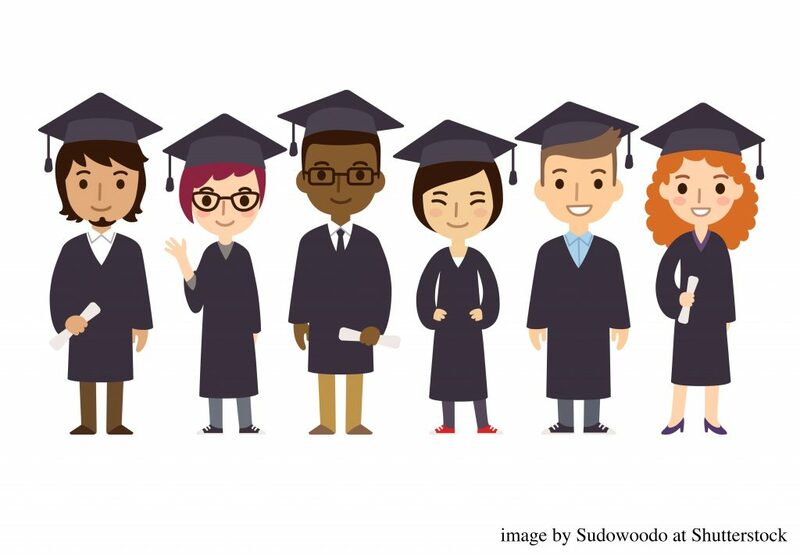 You could also think about sponsoring a prize for the best female student in a relevant course, or helping to fund a university scholarship for women who enroll in courses that could lead to a career in your company’s field. 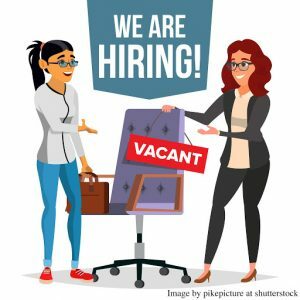 Need to hire more women? We can help. Send us an email and one of our team will get back in touch.